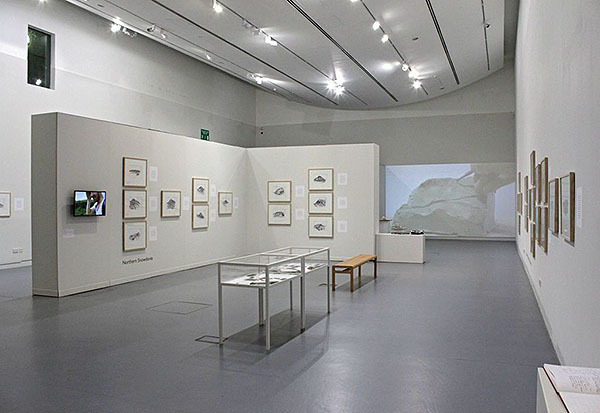 Documentation of solo exhibition at Aberystwyth Arts Centre developed with the help of an Arts Council of Wales production grant, which ran from Nov 2016 to Jan 2017. Video includes excerpts from an interview conducted by Steffan Jones-Hughes. Does national identity really exist in the landscape? And is there such thing as a perfect, archetypal Welsh mountain? Through a series of absurd strategies, the works in the exhibition engage critically with nationalistic appropriations of landscape. Underpinned by a kind of systematic nonsense, the drawings, texts, videos and photographs in the show invite us to reconsider our own relationship to the hills, mountains, fields and lakes of our own “homeland”, wherever that might be. Skeptical, ambivalent, and at times just plain ridiculous, the strategies employed heroically fail to reach any conclusions about any of this at all.